When the war began in 1566, Imperial Spain was the world’s greatest superpower. By the time it ended, in 1609, ‘the Spanish century’ was over. 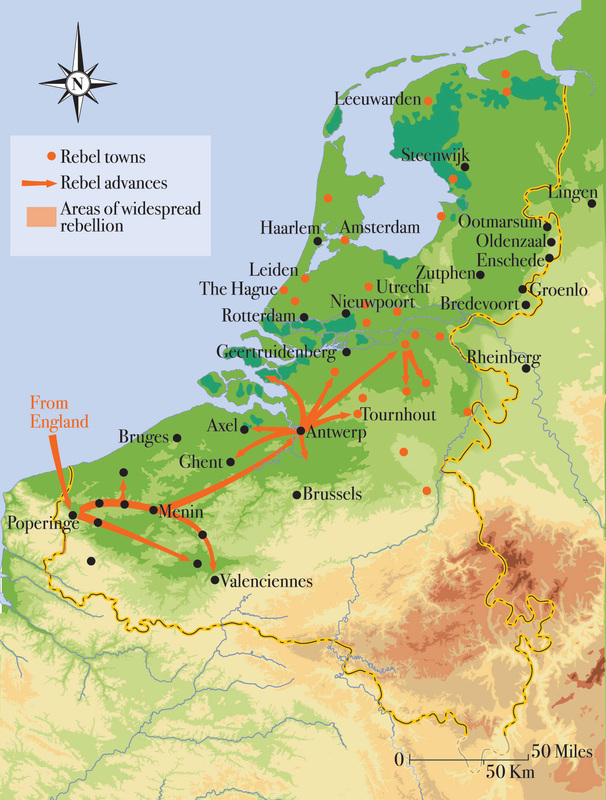 The Dutch War of Independence was the defining conflict of its era. It secured the triumph of the Reformation in north-west Europe, and along the way reconfigured the geopolitics of the Continent. It also produced one of history’s greatest captains, and completed the transition to a new way of war. Maurice of Nassau, the Prince of Orange, became Captain-General of the United Provinces in 1587. A master of siege-warfare, he turned the tide of the war with the capture of Breda (1590), Zutphen (1591), Steenwijk (1592), and Geertruidenberg (1593). 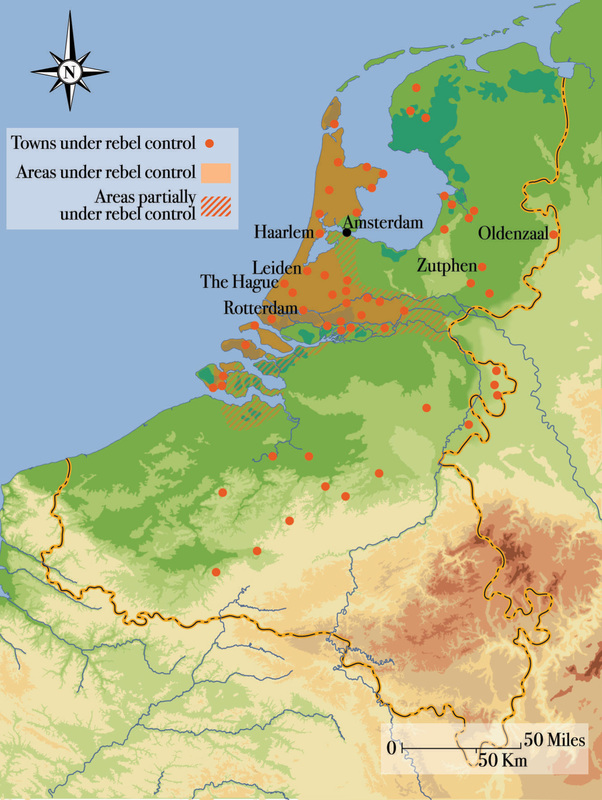 Four years later, in a lightning campaign, he captured no fewer than eight further towns, such that Holland had, by the end of 1597, cleared its territory of foreign troops and secured its borders. Having reformed the army, moreover, he faced the Spanish in the open field, and won two stunning victories: at Tournhout in 1597, and at Nieuwpoort in 1600. Central to Maurice’s reforms were linear formations and intensive drill. Only thus, he realised, could the full potential inherent in the development of firepower be realised, for the blocky formations of the Medieval past were clumsy in manoeuvre and wasteful of manpower. Below are the maps from the 17-page special feature on the Dutch War of Independence, seen in issue 52 of Military History Monthly. Flemish and Dutch opposition to Spanish Catholic rule explodes in weeks of politico-religious rioting. Churches are vandalised and plundered. Conservative town councils are overthrown and replaced. Most of the local aristocracy remains loyal to Spain, but the House of Orange puts itself at the head of the Protestant forces. An Spanish army is dispatched under the Duke of Alva, and this first uprising is crushed. er the capture of the city in November 1576, 1,000 houses are destroyed and 8,000 people are killed. Military terror defeats the Flemish movement, and restores Spanish rule in Belgium. er his death (1586), the main English army withdraws (1587), but contingents of English volunteers and mercenaries continue to serve. These play a major role in the campaigns of Maurice of Nassau. After the assassination in 1584 of his father, William of Orange, Maurice of Nassau succeeds him as Captain-General and Admiral-General of the United Provinces. He then embarks on a ten-year series of stunning military victories, clearing Holland of enemy troops and securing its borders between 1590 and 1600. Despite Maurice’s victory at Nieuwpoort, he is forced to withdraw from coastal Belgium: the Dutch are too exposed attempting to campaign in this region. The Spanish then put Ostend under siege. Although the Dutch lose 30,000 men, their compatriots are able to keep them supplied by sea, and the siege lasts for 3 years and 71 days, one of the longest sieges in history. The Spanish lose 60,000 men, but they eventually take the town. 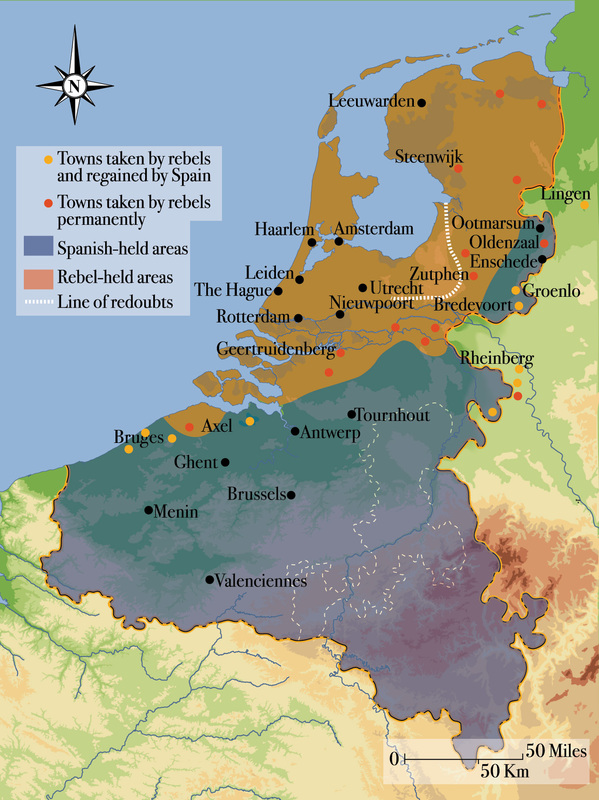 The Dutch have effectively secured their independence when a truce is agreed in 1609. However, they find themselves again at war with Spain when the Thirty Years War breaks out, though the epicentre of this titanic collision between the forces of the Reformation and Counter-Reformation is now Germany. 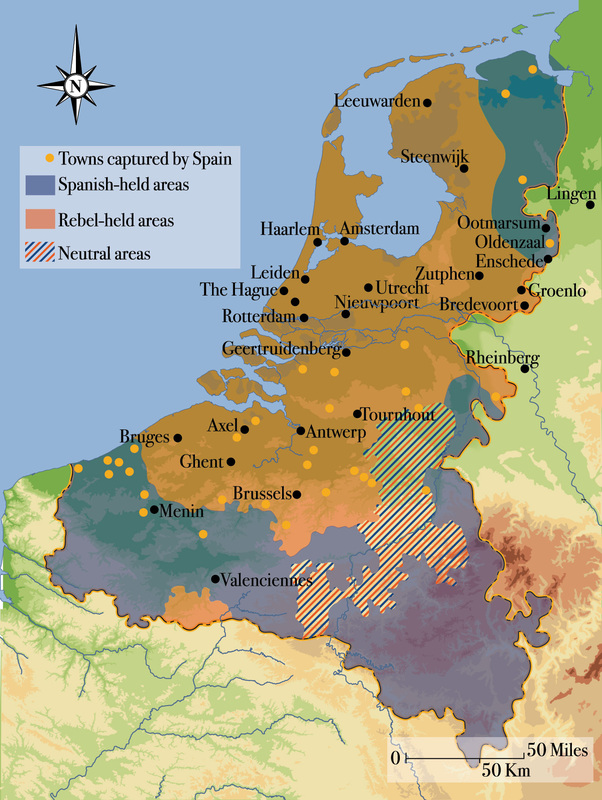 Spain does not give formal recognition to Dutch independence until the Treaty of Munster, part of the wider Peace of Westphalia, at the end of the Thirty Years War in 1648. By now, however, the Dutch ‘Golden Age’ is already under way. These maps appeared in issue 52 of Military History Monthly as part of the 17-page special feature on the Dutch War of Independence. Hi Joop, the discrepancy in spelling is due to Anglicised spelling of the Dutch original. A feature of the MHM house style in 2014.